Remember when Liverpool were fans were worried about Fabinho’s form after his summer move from Monaco? Seems like a long time ago now, doesn’t it? 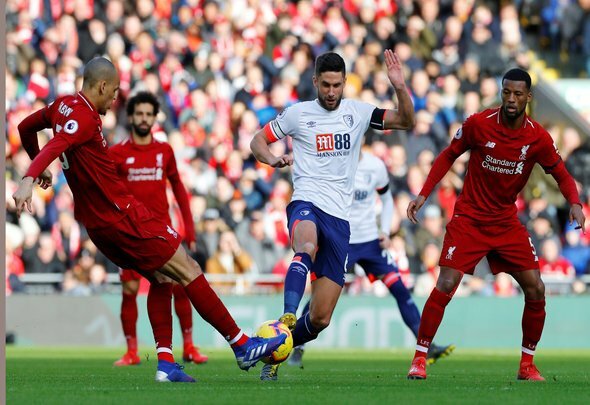 The Brazilian produced another wonderful performance in the first half of his team’s clash with Bournemouth at Anfield on Saturday. The 25-year-old has come on leaps and bounds in recent months and now looks nigh on undroppable for Jurgen Klopp. He looked so assured in the opening period against the Cherries, bossing the midfield and playing nice passes into his more attack-minded team mates. He knows his limitations and he knows his role, that’s what makes him so invaluable. He’s aware that players like Naby Keita, Mohamed Salah and Sadio Mane are better going forward so he simply wins the ball back, gives it to them and lets them do their thing. Every team needs a player like that, though, and he showed on Saturday why he is absolutely crucial to Liverpool’s title challenge in the second half of the season. Fabinho head and shoulders above everyone on this pitch so far.